With the recent Release to Manufacturing (RTM) of SharePoint 2013, I figured it was time to see what the new app development model is all about. When it comes to getting a SharePoint environment spun up quickly, nobody beats CloudShare. Within days of RTM, they had a “SharePoint 2013 RTM Small Farm” environment ready to spin up. SharePoint Server 2013 RTM (Windows Server 2012, 80 GB disk, 5 GB RAM) – also has Visual Studio 2012 Professional, and Office Professional Plus 2013 installed…in other words, everything you need to get started developing apps and solutions for Office 2013 and SharePoint 2013! My farm was provisioned and ready to go in less than 8 minutes! That’s countless hours of installation and configuration time saved, allowing me to get right down to business. Let’s start with a brief overview of the SharePoint 2013 app development model. Farm solutions allow access to the full SharePoint server-side API and run in the context of the SharePoint server process. They have a significant footprint on the SharePoint server and are capable of causing farm-level outages if errors or other issues occur. Sandboxed solutions allow access to a limited subset of the SharePoint server-side API and can be deployed and managed by site collection administrators. They run in a separate memory process on the SharePoint server, confining problems to the site collection level if errors or other issues occur. Because of the nature of farm solutions, they required an on-premises deployment of SharePoint. Hosted and multi-tenant installations of SharePoint could take advantage of sandboxed solutions, but many developers viewed them as significantly limiting in terms of the capabilities they could offer. In fact, developing new sandboxed solutions is deprecated in SharePoint 2013 (although existing sandboxed solutions are still supported). SharePoint-hosted apps are deployed to a SharePoint 2013 site (an SPWeb known as the host web) and provision their resources on a subsite (an SPWeb known as the app web). These are the mechanism of choice for simple solutions that interact with SharePoint lists and libraries and require the use of client-side technologies (such as the REST-based APIs and/or the Client Script Object Model) to interact with the SharePoint server. Provider-hosted apps are deployed outside the SharePoint server and can run in the cloud or on a separate web server (running IIS or any other platform). 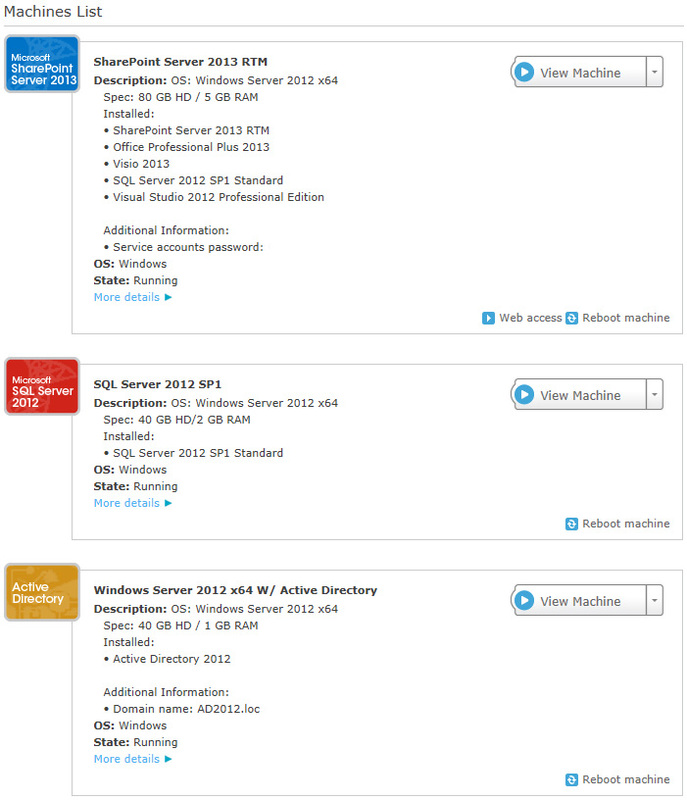 Autohosted apps automatically provision web sites and databases to Windows Azure and SQL Azure in a way that is transparent to the end user, allowing for ultimate scalability and flexibility. SPException thrown: Message: Apps cannot be installed. Review the diagnostic logs for more details regarding app deployment failures. As it turns out, before you can begin to develop and deploy apps for SharePoint in the SharePoint 2013 RTM Small Farm environment, some additional configuration is necessary. As I go through these steps, I will be logged in to the SharePoint server with an account in the farm administrators group. I will also be logged in to the domain controller with a local administrator account on that machine. To help ensure security within apps for SharePoint, a separate DNS domain name is required for all installed apps. This domain should NOT be a subdomain of the domain on which SharePoint is hosted. This process of app isolation ensures separation between the app and SharePoint sites to prevent unauthorized access to user data as well as guard against cross-site scripting (XSS) attacks. 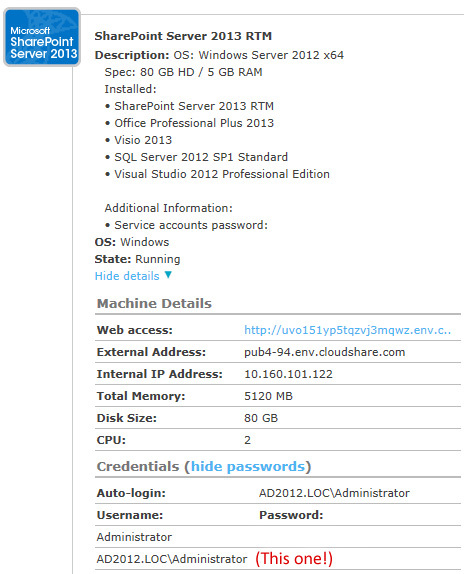 In the CloudShare SharePoint 2013 RTM Small Farm, a SharePoint web application is configured at http://sp2013srv. 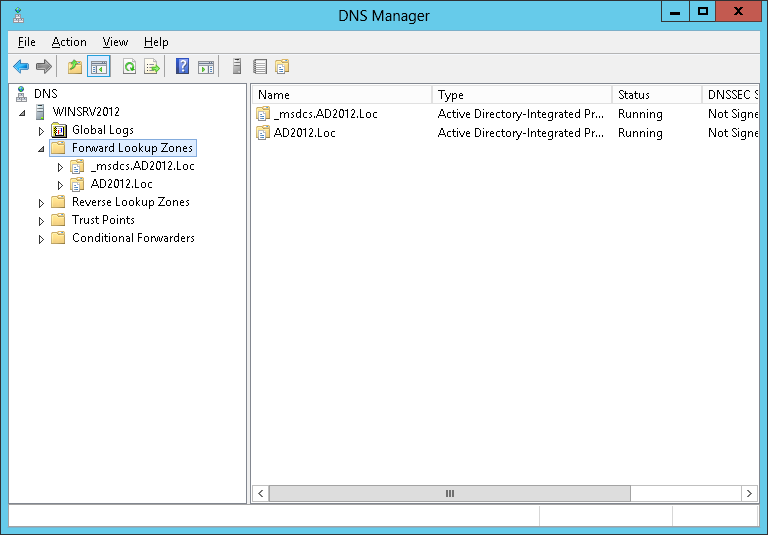 I will set up DNS to support apps for SharePoint running on the domain sp2013apps.com. Every time an app is provisioned, a unique DNS name will be created (such as apps-12345678ABCDEF.sp2013apps.com, where 12345678ABCDEF is a unique 14-character identifier for the app and apps is a special prefix I define). The configuration steps below will allow us to resolve these domain names. 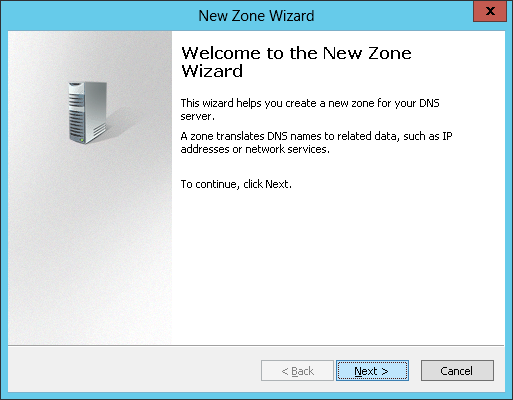 On the Windows Server 2012 x64 W/ Active Directory server (our domain controller), we launch DNS from the Windows Server 2012 Start screen. On the opening screen of the wizard, click Next. 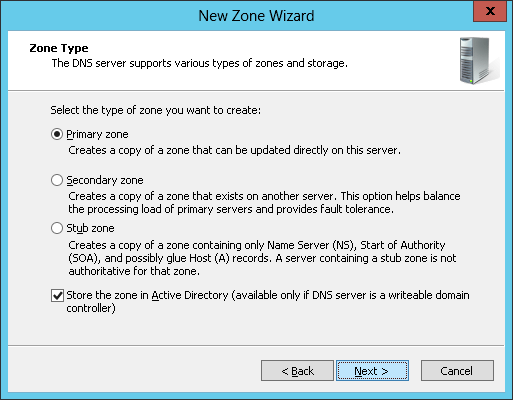 Choose Primary Zone, select Store the zone in Active Directory and click Next. 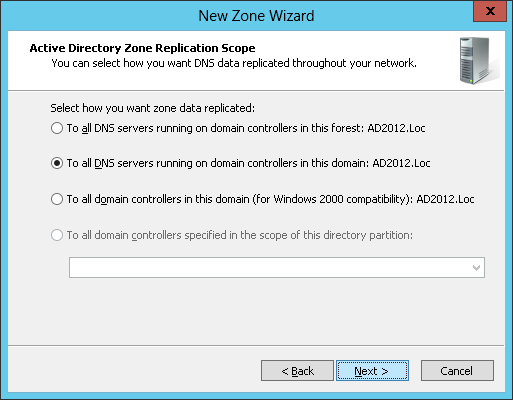 Choose to replicate the DNS data To all DNS servers running on domain controllers in this domain and click Next. 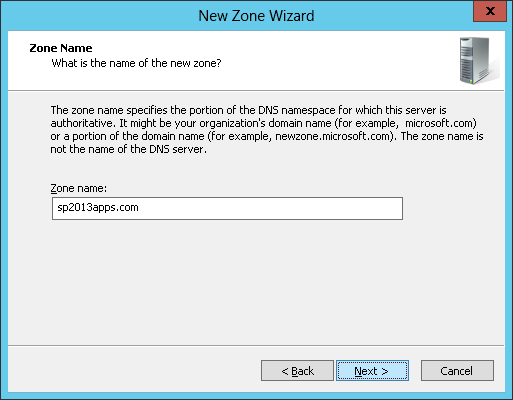 Enter the name of the new zone (in our case, sp2013apps.com) and click Next. 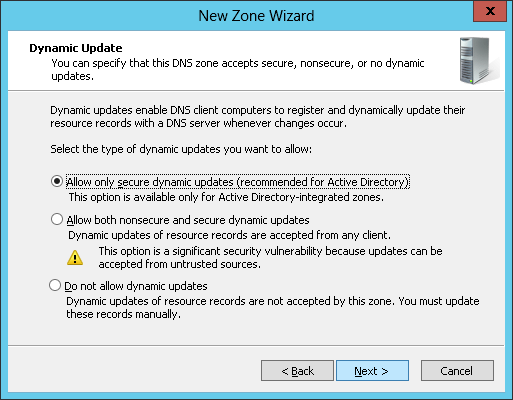 Select Allow only secure dynamic updates and click Next. In the Alias name field, enter * to allow for unique aliases to be created as apps for SharePoint are provisioned. 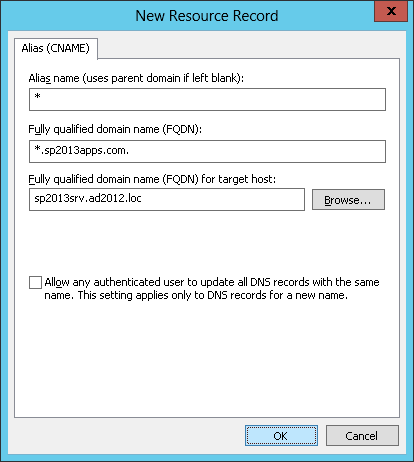 Enter sp2013srv.ad2012.loc (the FQDN of the SharePoint server) and click OK.
We can verify our DNS setup by pinging a random unique domain name on our app domain. 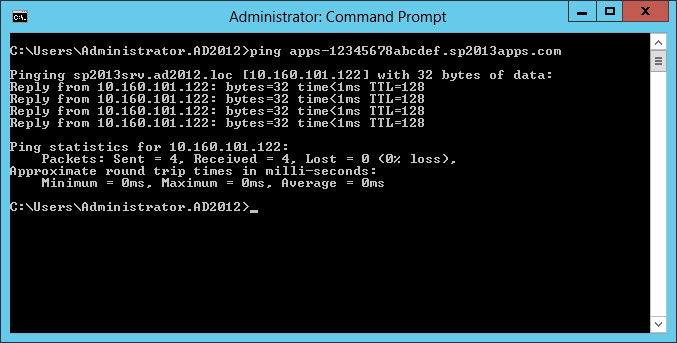 Open a command prompt and enter ping apps-12345678abcdef.sp2013apps.com. If the domain resolves, everything is set up properly. Note that in a production environment, you would want to use SSL for your apps for SharePoint. In that case, you would also need to obtain and configure a wildcard SSL certificate for your app domain. When prompted, enter the value for ExistingPassword (which can be obtained from the machines list on the environment’s home page). Finally we must define the app prefix for apps to use in our environment. 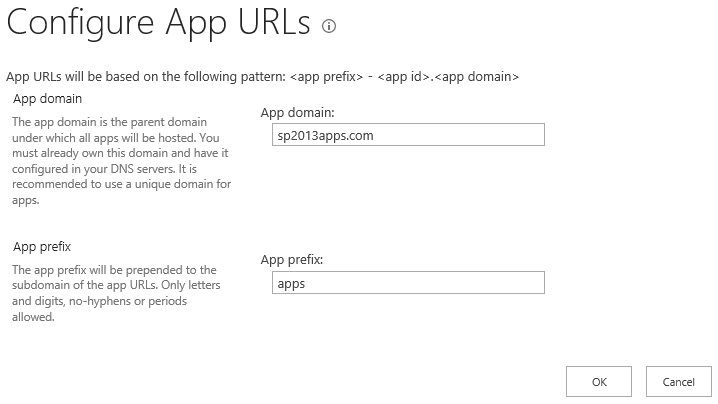 For instance, the app URL apps-12345678abcdef.sp2013apps.com has a prefix of apps. We will configure our environment to use this prefix. From Central Administration, go to Apps. 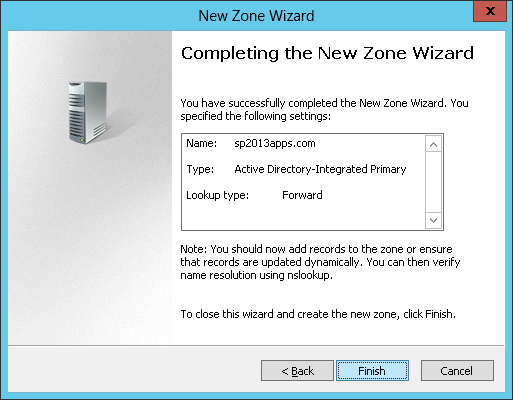 Specify an App domain of sp2013apps.com and an App prefix of apps, then click OK.
After completing these configuration steps, the CloudShare SharePoint 2013 RTM Small Farm is now ready to support the development, installation, and deployment of Apps for SharePoint!